Similar agitations were held on the Mumbai-Pune Expressway and the Bandra-Worli Sea Link. Hours after Maharashtra Navnirman Sena (MNS) leader Raj Thackeray told his party workers not to pay toll tax, MNS workers went on a rampage, targeting toll booths across the state. Incidents of violence were reported from Mumbai, Pune, Nagpur, Jalna, Aurangabad, Beed, Nanded and Nashik. Addressing party workers in Navi Mumbai on Sunday night, Thackeray said, “Do not pay toll anywhere in the state. In case anyone stops you and asks for toll, thrash him.” Following his order, MNS workers raided toll booths on Sunday night and early Monday morning and ransacked toll collection centres. In various places, senior MNS leaders, including party MLAs, led the mob. MNS legislator Pravin Darekar and at least 25 of his supporters were detained at Dahisar, a suburb in Mumbai, after party workers attacked a toll plaza. Party MLA from Kalyan, Prakash Bhoir, was also detained for leading a mob in an attack on a toll booth in Kalyan. In Nashik too, MLA Vasant Gite was detained for trying to stop toll collection. Similar agitations were held on the Mumbai-Pune Expressway and the Bandra-Worli Sea Link. The Bandra police arrested eight MNS workers for allegedly trying to vandalise the Bandra-Worli Sea Link toll booth. Meanwhile, security has been stepped up at toll booths across the state. The state government said it would look at Thackeray’s speech before taking any action against him. “Nobody will be allowed to take the law in their hands. 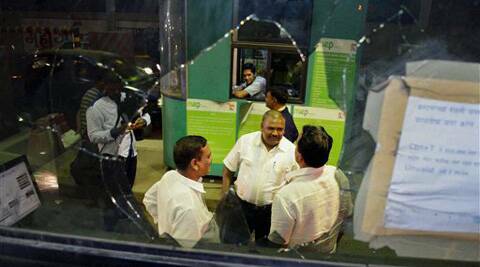 The police have already taken action against those responsible for vandalising toll booths,” Chief Minister Prithviraj Chavan said. “If some political party leader asks his supporters to indulge in violence, this kind of behaviour in a progressive state like Maharashtra will not be tolerated,” Deputy CM Ajit Pawar said. Thackeray’s critics claimed he was trying to revive the issue as elections are set to be held soon. “With elections around the corner, a lot of parties are trying to get aggressive and generate publicity,” said Shiv Sena MP Sanjay Raut.